Repetitive pairing of stimuli to the motor cortex and peripheral nerves supplying muscles can induce plasticity at synapses between nerve cells that control voluntary muscle activity. This technique has therapeutic potential for enhancing activity at synapses that lie within the spinal cord and transmit commands from the brain to the muscles; thus the technique may be relevant for people with decreased muscle control, such as in incomplete spinal cord injury. This technique has been shown to enhance muscle activity of the biceps in able-bodied participants (Taylor & Martin, 2009) and can improve manual dexterity of the hand in participants with incomplete spinal cord injury (Bunday & Perez, 2013). However, as this is a relatively new technique, further studies are required in order to optimise the methods. For example, is more necessarily better? That is to say, can we improve the technique by increasing the number of pairs of stimuli to the motor cortex and peripheral nerves? To answer these questions we conducted a study in able-bodied participants comparing 100 pairs of motor cortical and peripheral nerve stimulation to 50 pairs, and also to a control protocol of 50 unpaired stimuli to the brain. We observed the size of muscle responses before and after each protocol (50 pairs, 100 pairs and 50 unpaired stimuli). We found that 50 stimulus pairs produced variable and unreliable results day‑to‑day whereas the delivery of 100 pairs of motor cortical and peripheral nerve stimulation produced very reliable increases in the size of muscle responses. These increases lasted for at least one hour. We believe that these changes reflect a strengthening of synapses in the pathway that controls voluntary muscle activity. 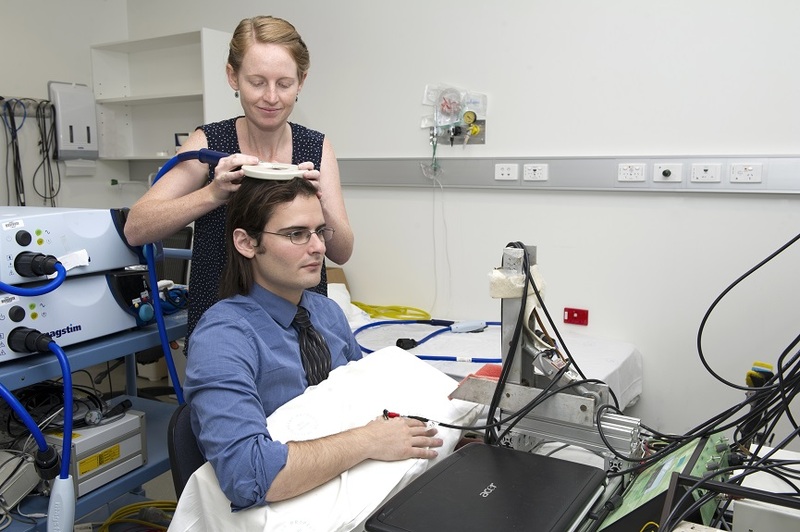 PhD candidates Siobhan Fitzpatrick and Jim Nuzzo, using transcranial magnetic stimulation to activate the motor cortex. The delivery of more paired stimuli produces more reliable enhancement of activity at synapses responsible for transmitting commands from the brain to muscles. This is a non-invasive, well tolerated technique with therapeutic potential for improving muscle control in people with decreased descending drive, in conditions such as incomplete spinal cord injury, stroke and other disorders of the motor pathway. Fitzpatrick SC, Luu BL, Butler JE, Taylor JL (2015). 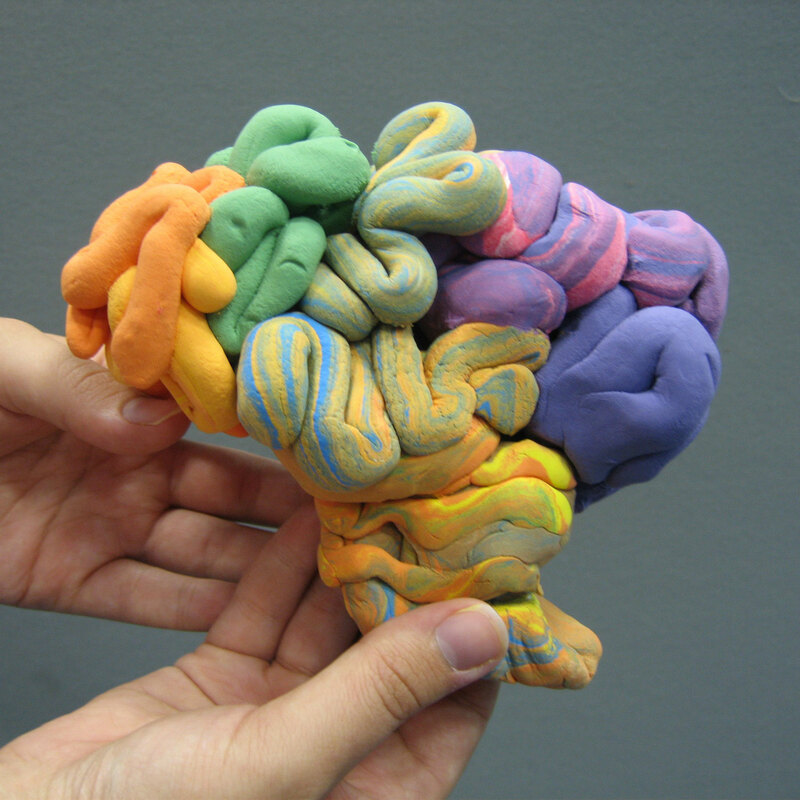 More conditioning stimuli enhance synaptic plasticity in the human spinal cord. Clin Neurophysiol (In Press). Bunday KL, Perez MA (2013). Motor recovery after spinal cord injury enhanced by strengthening corticospinal synaptic transmission. Cur Biol 22: 2355-61. Taylor JL, Martin PG (2009). Voluntary motor output is altered by spike-timing-dependent changes in the human corticospinal pathway. J Neurosc 29: 11708-16.